They claim to be a cryptocurrency miners’ best friend and I could see how they come to that conclusion. 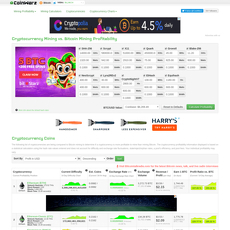 The website offers several mining tools as well as crypto currency converters. This site is really simple to use but lacks features I have found in other cryptocurrency mining-based websites. o Helps you determine the most profitable coins to mine with a specific GPU mining rig. 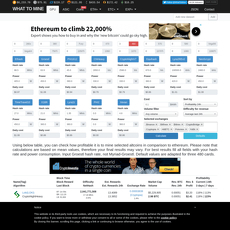 - Ethereum Mining Profitability Calculator. 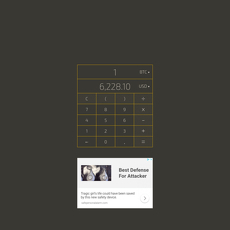 o This calculator helps the miner identify the profitability of any mining rig set up for ETH with advanced break-even analysis. 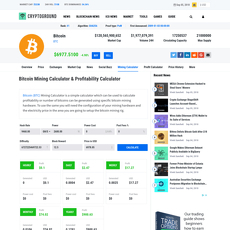 o This calculator helps the miner identify the profitability of any mining rig set up for BTC with advanced break-even analysis. o Easy to use converters that implement real time stats from various markets between any two currency pairs, including several different fiat currencies. This site is jam packed with features a miner would greatly benefit from. It could really be a miner’s best friend like they claim. 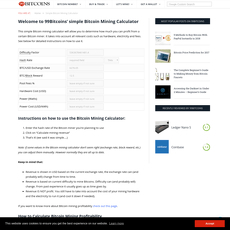 There are better cryptocurrency mining tool website available. 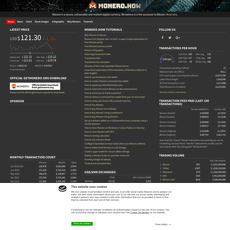 The site offers less altcoins then other tools available.